Forget the cute pumpkins and sweet kids costumes this Halloween. This snow globe has a major creep factor and is waiting for the perfect spot on your spooky themed mantel, buffet or coffee table! RAZ Imports scary graveyard snow globe decoration measures 5.25″L X 4.75″W X 6″H. 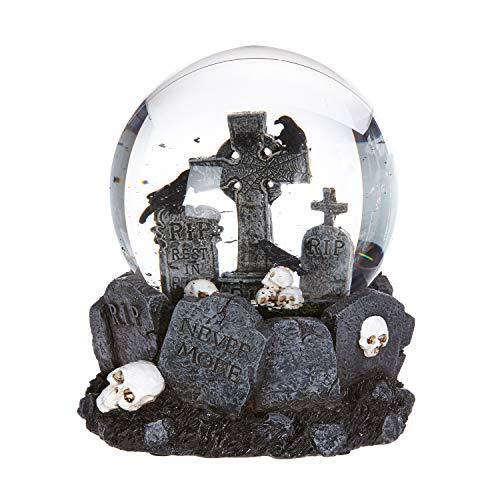 Halloween horror snow globe is made of polyresin and features tombstones, ravens on skulls. Black flecks swirl when snowglobe is shaken, giving the appearance of creepy bats flying through the night. A perfect addition to your gothic statues and figurines, tombstone, raven & skull decor. Great for indoor home Halloween decorations. High quality, spooky snow globe will delight for years to come.